Food contestants at the World Food Championships are well known for their big hearts, big passion and big ideas. But this year, they may have to break out their BIG RECIPE books like never before! 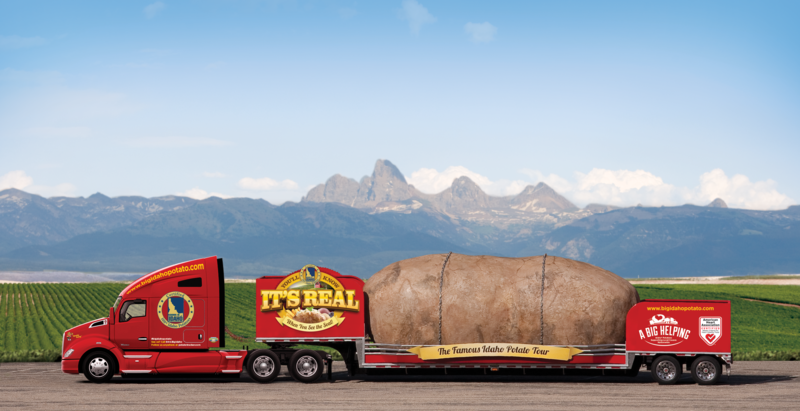 That’s because WFC just announced a new partnership with the Idaho Potato Commission (IPC), the organization that celebrates the American Heart Association certified heart-healthy Idaho® potato — by touring the country with a 4-ton potato on a 28-foot-long, 12-foot-wide, 18-wheeler truck! This American icon and fan-favorite attraction will be appearing at #WFC2018 as part of the new relationship with the IPC, which will be providing Idaho® potatoes as the key structure build in the Chili category this year. It only makes sense that the World’s largest potato will be featured at the World’s largest kitchen arena, where almost 500 cook teams will compete in 10 categories to see whose recipe skills will take home the ultimate bragging rights in Food Sport. Idaho’s growing season of warm days and cool nights, combined with plenty of mountain-fed irrigation and rich volcanic soil, produce the unique texture, taste, and dependable performance of their potatoes. IPC’s valuable research on growing techniques, food-safety issues, handling, and distribution has helped them become one of the leaders in the industry. In addition to harvesting the country’s tastiest tater, the IPC is dedicated to providing their customers with quality support through educational training and merchandising materials. Since hitting the road in 2012, the potato truck has become a pop-culture phenomenon. This tater is 1,102 times heavier than the largest potato ever grown and would easily make over 1,500,000 average-sized French fries. To learn more interesting facts about the potato, click here. To learn more about the Idaho Potato Commission and the nutritional benefits of their potatoes, click here. Make sure you stay in the loop on all Food Sport developments at WFC by following our social media, including other structure builds and infusions that will be released in sponsor announcements over the next several months. For all WFC updates, follow World Food Championships on Twitter (@WorldFoodChamp), and Facebook and Instagram (@WorldFoodChampionships). The 7th Annual WFC, presented by Walmart, will be held Nov 7-11 at The Wharf in Orange Beach, Alabama. But first, the culmination of the 6th annual championship is occuring in Bentonville, Arkansas on April 22nd at Brightwater, a world-class institute devoted to the study of food. To purchase VIP tickets to WFC’s Final Table, visit https://worldfoodchampionships.com/tickets.